Avast there me hearties! - The downstairs bar where Vandermeer and Ford made their home had a distinct nautical feel. 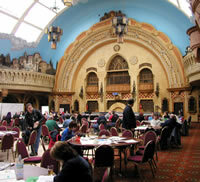 The Games Room (not) - Like every other seaside venue, the Winter Gardens had no lack of slot machines. Railway Architecture - The main hallways of the Winter Gardens reminded me of one of Brunel's stations. 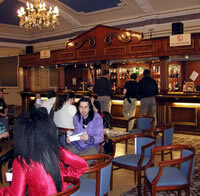 The Dealers' Room was a long, curved corridor with the Art Show at the end. Despite the odd shape it actually worked quite well. Essential Services - The main bar was nice and roomy, but apparently the beer selection was poor and the service very slow. 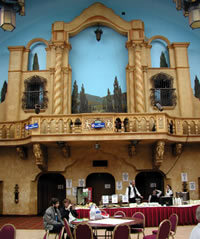 The Spanish Room - This huge and rather eccentric space was given over to socializing, food and gaming. If only all of the program rooms had opened off it. 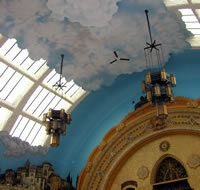 Send in the Clouds - Who needs the Sistine Chapel when you have the ceilings at the Winter Gardens? Oh dear. Don't Jump, Manuel - The catering services were located below this magnificent if rather pointless balcony. 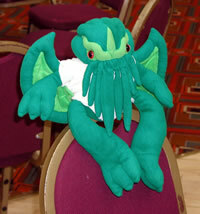 Fluffy Friend - The con accepted members of all species, including this younger member of the Stross household . 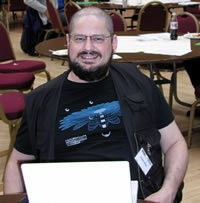 Trend Setter - Charlie Stross shaved off his hair for summer. A week later David Beckham did the same. Could this be the secret to winning Hugos?